We have been visiting Comitan now for several years. It's a great stop off between the countries of Mexico and Guatemala and it's warmer and less touristy than San Cristobal de las Casas. 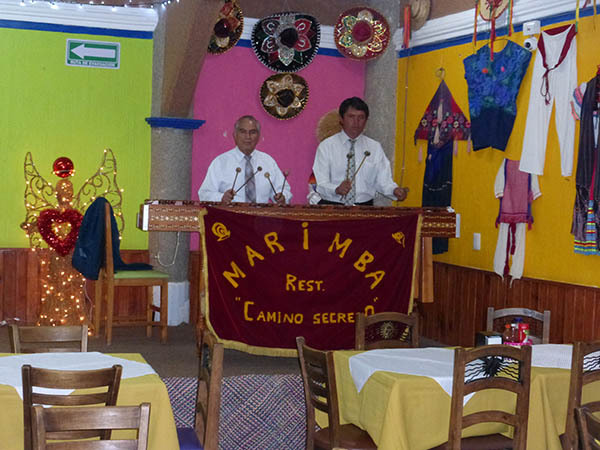 One of our favorite things to do is to visit Camino Secreto, a family oriented restaurant that has a marimba band and an unusual happy hour. The lighted sign on the outside of the restaurant. Camino Secreto means Secret Path. 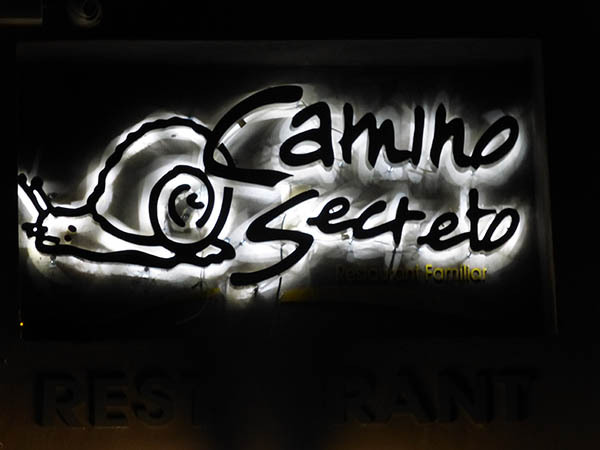 It gets crowded at Camino Secreto, so there are places to sit until a table opens up. 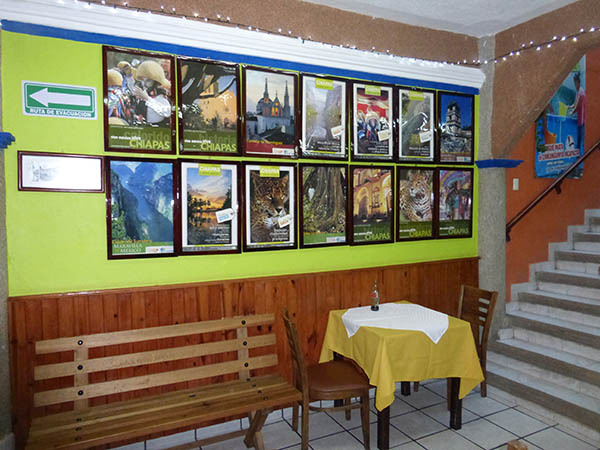 Colorful posters advertise the thrilling offerings of the Mexican state of Chiapas. 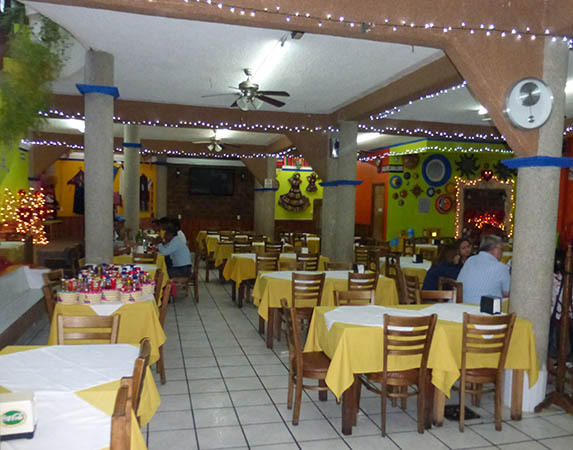 Camino Secreto offers breakfast, lunch and dinner. Marimba music is played every evening. To the right of the photo is a play area for children - a miniature playground with a jungle gym, a soft place to jump around and miscellaneous plastic slides and toys to ride. 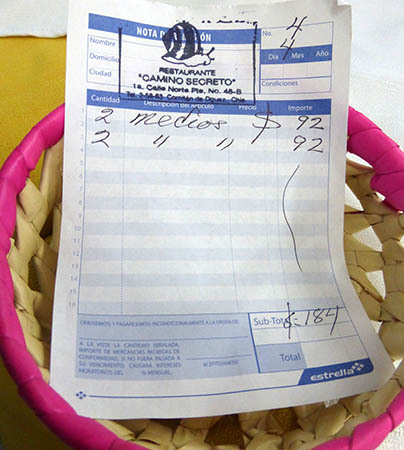 What is unusual about Camino Secreto is that the beers are 46Pesos, about $2.50USD and the food comes for "free." The price of the beers are about double what you would pay outside in another restaurant, but the food they bring is amazingly tasty and worth the extra price of the beer. Here you see what might look like a sparse appetizer plate, but it is only the beginning! 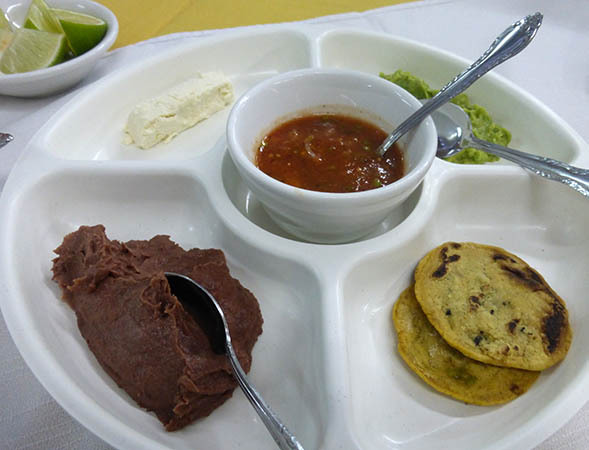 Some "morning" cheese or "day" cheese is at the top, guacamole, stuffed tortillas, salsa and refried beans. Really, really flavorful. "Morning" or "day cheese" is a light, cottage cheesy type of cheese that is made fresh every morning. You can eat it alone, sprinkled on salads, spread on a tortilla or toast, fried in a batter or in just about any dish where you might want some extra protein. You can find morning cheese all over Mexico and Central America. Marimba is a common sound heard in these parts of the world. The percussion instrument is a type of xylophone made with wooden slats and wooden resonator tubes just underneath to create the tones. The two men here go vigorously at the wooden slats with their mallets and at a fast pace. It's a musical thumping that is contagious. They create their own musical world which is fun and uplifting. 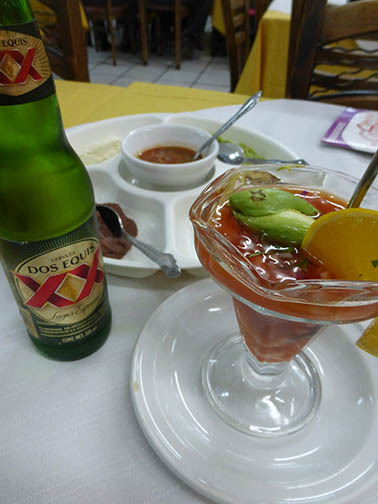 With your first beer, you are offered a selection on the beginning tier of foods. Billy ordered a seafood cocktail with a mixture of shrimp, octopus and crab in a cold tomato-y sauce with raw onions, avocado, lime and parsley. I went with a seafood soup that was exquisite. Shrimp and crab in a broth that was outrageously good. Crispy tortilla chips were served on the side. 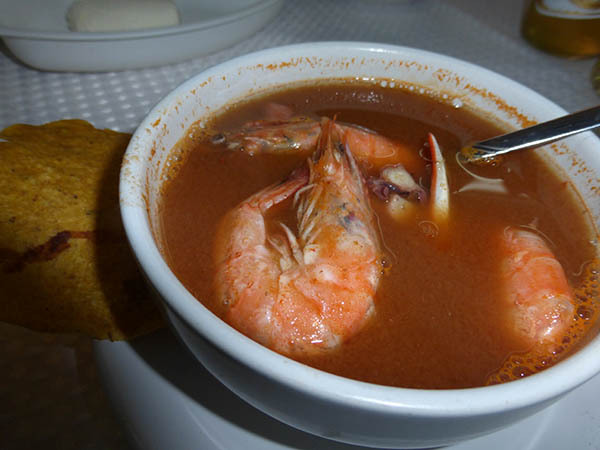 In Mexico and Central America, seafood is often served with the tasty shells still on them. Locals eat the shells and all, or you can break open and remove the outsides. Either way, it's really full of flavor. If you have never eaten Mexican Chamorro, you have not lived. 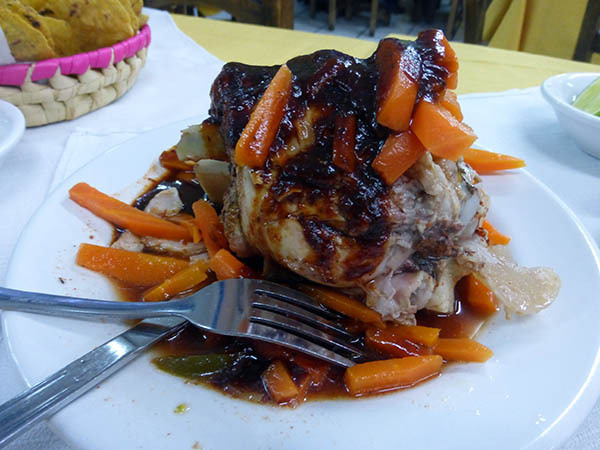 Slowly cooked pork shank with achiote pepper sauce (not spicy) and marinated carrot strips. The pork falls off the bone as a perfectly cooked pot roast pulls apart. Melt-in-the-mouth heaven, for sure! We absolutely destroyed that baby. There was nothing left! As you can see, we were only charged for our 2 beers each with the total coming to 184Pesos, which - with the current exchange being 18+Pesos to $1USD - was just over $10USD. Of course we left a tip and our waiter was most happy. So were we! We had live music, beer and food to die for! If you ever visit Comitan, you really must make a stop at Camino Real. We hope you enjoy it!